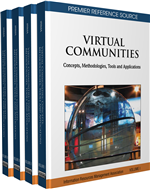 Multi-user virtual communities have become an accepted fundamental component of communication whereby community members share information and knowledge for mutual learning or problem solving.Virtual communities in a multi-user virtual environment (MUVE) have evolved into active social networks, formulating an alternative social existence and this phenomenon warrants further investigations. In these virtual social networks (VSNs), member participation is essential for their success. Therefore, developing knowledge on how to manage and sustain participation of members in VSNs fills a gap in our academic understanding of the dynamics underpinning the processes of virtual community development. This article aims to address these issues by extending the theory of sense of community into a virtual context (SOVC) and by integrating it with other communication theory of U&G.